Kinosaki Onsen is a hot spring located in Hyogo Prefecture. This coastal city is famous for having preserved its original beauty, and for its seven public onsen. In all honesty, Kinosaki is one of the most beautiful onsen I’ve visited. This coastal village encircled by hills lives thanks to its seven hot springs. I was really dazzled by the authenticity of the place, which is very far from the modern and uninteresting structures that can be found in many other Japanese spas. The city is relatively easy to access, even if you do not travel by car. Indeed, the railway allows you to reach this place from the main cities of Kansai. 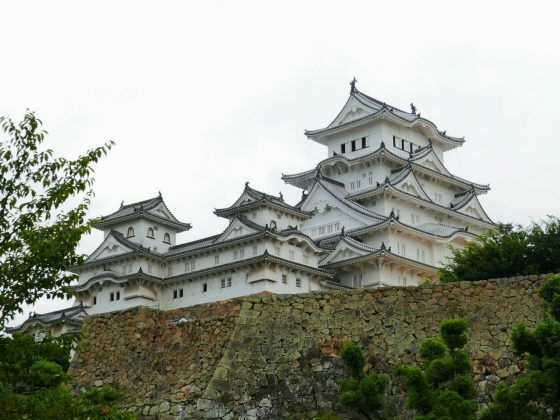 So you have no excuse for not making a stopover there on your next trip to Kyoto or Osaka! The Kinosaki village is located north of Hyogo Prefecture, on the Sea of Japan coast. This hamlet is famous throughout Japan for its hot springs. Some even consider it to be one of the best hot springs in Japan. As far as I’m concerned, I do not have the knowledge to judge the therapeutic qualities of Kinosaki Onsen waters. However, I can tell you that this is one of the most lovely Japanese villages I have visited. The village is built around a canal where onsen and ryokan succeed each other in wooden houses that never exceed more than three levels. Kinosaki Onsen has kept its authenticity, and that’s what most tourists come to enjoy. Seven onsen share the naturally warm waters of the region. During my visit, I was able to try three of them thanks to a pass that gave me unlimited access to all of these establishments. It is also quite funny to plan an “onsen crawl”, as some cities propose their pub crawls. Every onsen is really authentic, but none of them is identical. It is always a pleasure to discover the inside of these public baths, even sometimes their outside. Because some establishments offer sotoyu, these outdoor baths that the Japanese love so much. As for the ryokan, the typical Japanese inns, you will find more than a dozen in Kinosaki. Many of them are family affairs. I was lucky enough to spend one night in Kobayashiya, one of the oldest ryokan in Kinosaki. 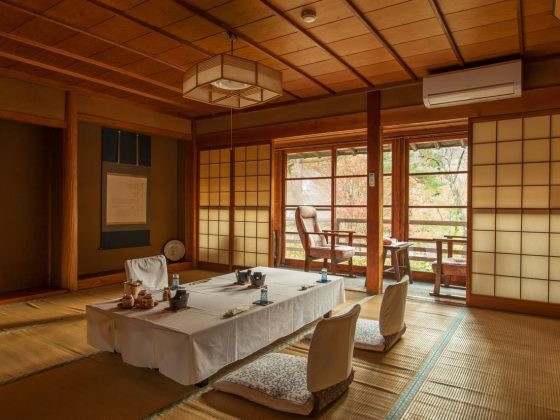 This hostel run by the Kobayashi family for generations has even been listed as a Japan’s cultural material properties in 2015. Which does not really surprise me, since I felt like I was traveling 150 years back when I went there. An unforgettable meal in Kobayashiya..
During my stay in Kobayashiya, I was able to enjoy a kaiseki for dinner, then I admired people in yukata crossing the village canal bridges from the veranda of the room. My night went well thanks to the comfortable futon that had been prepared by the house staff. Despite its small size, Kinosaki Onsen has an atypical story mixing legends and proven facts. The story of the village foundation adds magic to this lovely place. That’s why I decided to tell you about it in this article. Legend has it that Kinosaki Onsen was founded by the Buddhist priest Douchi Shonin during the eighth century. The presumed founder of this hamlet had a vision in which he would have concluded that he had to pray for a thousand days in order to guarantee the good health of the local population. It would be after this almost three-year prayer that a hot spring would have sprung from the ground. Another legend tells that the Kouno-yu bath was discovered later, after a stork had healed his wounds by bathing in this hot spring. As you can see, this village in northern Hyogo prefecture has a folklore that tries to explain why this place is one of the best hot springs in Japan. The poetry that emerges from the Kinosaki Onsen myths has inevitably attracted many renowned Japanese artists over the last thirteen centuries. Poets, writers and painters have stayed in the ryokan of this village in search of inspiration. Famous writer Naoya Shiga is one of those prestigious guests who walked the streets of Kinosaki. He wrote a short novel entitled “In Kinosaki” (城の崎にて in Japanese) in 1917. In this work, a man comes to enjoy the therapeutic benefits of the hot springs of the village after being hit by a train of the Yamanote line, in Tokyo. A fire caused by an earthquake destroyed most of the village in 1925. The inhabitants decided to rebuild the hamlet by preserving the traditional wooden architecture characterizing the ryokan of Kinosaki. This explains the charm of this spa that has not succumbed to the modernity of large hotel structures. Open from 1 pm to 9 pm. Closed on Mondays. It is the onsen closest to the station. It has an outdoor bath on a panoramic terrace. After admiring the view, you can try the ice sauna. Open from 7 am to 11 pm. Closed on Friday. This bath has a more modern architecture inspired by Japanese lanterns. According to the Kinosaki Tourist Office, this is one of the most popular baths among the local population. Open from 3 pm to 11 pm. Closed on Wednesdays. This onsen has a reputation for ensuring women fertility. The opening of the establishment is indicated by the sound of a taiko, a Japanese drum, located in the attic of the building. Open from 7 am to 11 pm. Closed on Wednesdays. This building inspired by kabuki theaters hides a bath with a cave made of natural rocks. This onsen has a reputation for protecting people who bathe there against traffic accidents. Open from 7 am to 11 pm. Closed on the first and third Thursday of each month. The building is inspired by the architecture of the Kyoto Imperial Palace. This property with an outdoor bath has a reputation for bringing luck in love. It is the waters of the Mandara-yu which would have sprung up after the thousand days of Douchi Shonin’s prayer. The onsen’s outdoor bath is on the side of a hill. Open from 7 am to 11 pm. Closed on Tuesdays. This is the oldest establishment of Kinosaki. It is in its waters that the wounded stork of the founding myth came to heal its wounds. This onsen is the most eccentric. It takes about a 20-minute walk to get to Kinosaki Onsen train station. Of the seven onsen in Kinosaki, at least five offer outdoor baths: Satono-yu, Ichino-yu, Goshono-yu, Mandara-yu and Kouno-yu. It is possible to make a day trip to Kinosaki Onsen. But be warned, I only recommend this if your hotel is in Himeji and you are traveling by train. Indeed, the bus service is not very convincing, and car trips are longer than those by rail. In addition, the other Kansai cities are a little further away from Kinosaki, which can be a problem if you are not ready to wake up early in the morning to get to the onsen. The village has its JR Kinosaki Onsen station. It is therefore possible to go to this onsen with a JR Pass or a pass from the greater Kansai area. As I told you earlier, you have no excuse for not going there! Take the Limited Express Hamazake train from Himeji Station. Take the Limited Express Hamazake Train from Sannomiya Station. Take the Limited Express Konotori train to Osaka. It is also possible to travel to Kinosaki Onsen by bus from the major cities of Kansai. This transport mean is less convenient than trains. There are only two buses a day on Saturdays and Sundays. I advise you to use the train instead. Two Express buses per day are provided by Zentan Bus. Reservation required. Two express buses per day are provided by Zentan Bus for the price of 3600 yen. Reservation required. You can also drive to the health resort of North Hyogo Prefecture. This has no interest in comparison with the train. Unless you want to visit other places difficult to access in the area. Two car parks are located on both sides of Kinosaki Onsen Station. You will have no trouble parking near your ryokan because the village is not very extensive. You can find all the events taking place in the onsen on theKinosaki Onsen tourist office website. An unforgettable meal in Kobayashi ….and uncomfortable…no?